Billy Sharp celebrates a goal in a Leeds United shirt. Billy Sharp sent a message of thanks to Leeds United fans for the support he received in his time at the club before it officially came to end with a transfer to Sheffield United. Sharp’s move, for an undisclosed fee, was confirmed on Saturday and became inevitable after he was not played in the most recent pre-season games involving Leeds and head coach Uwe Rosler said there were too many strikers at the club. The 29-year-old, who moved to Elland Road from Southampton last summer, scored five times in 35 United appearances last term. Despite never quite establishing himself in the team, Sharp quickly became a fan favourite and is full of thanks to Leeds fans for the support they gave him during his time at Elland Road. 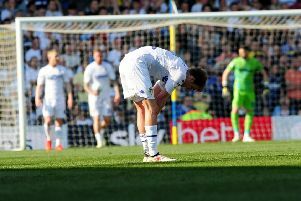 He took to Twitter to say: “It goes without saying a massive thanks to the Leeds fans who believed and supported me whenever I pulled the famous white shirt on. “Sadly things haven’t gone as well as I would have liked them to. Leeds, without Sharp, meanwhile lost their latest pre-season game 2-1 to Hoffenheim in Norway and go into their final friendly at home to Everton next week without a win so far in a first team fixture under Rosler. Hoffenheim went ahead through a Mark Uth strike in the second minute then lost star young midfielder Lewis Cook injured. Leeds hit back when on-loan midfielder Tom Adeyemi scored his first goal for the club only for Steven Zuber to win it for the German team in the second half. Boss Rosler was pleased despite the defeat and said afterwards that Cook had been taken off as a precaution after he had picked up a toe injury. He said: “I thought the first 45 minutes were excellent. “We camped in their half – against tough opposition from the Bundesliga. “We looked very strong physically and sharp. We pressed them high and they didn’t come out of their half. “We looked dangerous from set-pieces and we looked dangerous from open play. We had lots of chances – I’m very happy. “I praised the players a lot at half-time – probably a little bit too much – due to the fact that we were at the end of a hard week. “We couldn’t have kept that level up in the second half but we still had two or three very good chances. “It was just a couple of square passes where there would have been a tap-in – there was one for Souleymane and one for Morro. Mirco had a good chance too.